What's the quickest way to learn about Notejoy? How do I install Notejoy for Mac, Windows, iOS, or Android? How do I create a team library or notebook? Can I import my existing documents to Notejoy? Does Notejoy support Microsoft Office documents (Word, Excel, Powerpoint)? Can I view or present my notes full-screen? Is there an offline mode? 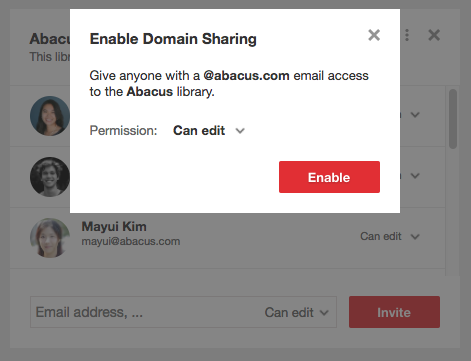 Can I share with team members outside of my company's domain? Where I can share my feature requests? How do I make the Slack iOS app open Notejoy links in the app? How do I link between notes? How do I remove a user from a team library? What's the best way to organize team libraries? How do I best use Notejoy as a wiki? How do I add emoji to a note? Does Notejoy support two factor authentication? How do I add users to a team library? Does Notejoy publish its roadmap? How do I re-order my list of team libraries? How do I re-order my list of notebooks? How do I tell if a library is upgraded? How do I see how much storage I've used? What does the "Add to organization" checkbox do? Can I import my notes from Evernote? What integrations does Notejoy support? What are the benefits of Notejoy's premium plans? Why do I constantly see a "something went wrong" error? Many teams are finding Notejoy to be a great alternative to traditional wikis like Confluence or Google Sites for creating a knowledge base for their entire organization. They find Notejoy's simplicity, speed, and focus on end-user productivity encourages team members to contribute knowledge and keep it up-to-date far more frequently compared to the wikis they have previously deployed. To get the most out of Notejoy as a wiki, we encourage you to take advantage of the following capabilities of Notejoy. Team libraries are a shared space for a team to collaborate. They support domain sharing to enable you to allow anyone with a valid email address in your company's domain to immediately get access to the team library without explicitly inviting them. You can have as many domain-shared team libraries as you like. With this feature, a new employee can join your company, signup for Notejoy, and immediately get access to your entire company's knowledge base. Oftentimes a company will create a team library for each department (Product, Engineering, Marketing, Operations, HR, etc) or on a per-project basis. They then share these team libraries broadly via domain-sharing. If you like, you can make certain team libraries read-only. For example, this is often common with HR policies so that only the HR team can edit but the entire company can view & comment. You can also always have additional team libraries that are only shared with a subset of people as well. For example, you might create a team library just for your executive team. Team libraries are made up of notebooks. Within each notebook, Notejoy shows a notebook overview that gives newcomers a sense of what the notebook is all about, including showing the most popular as well as most recent notes in the notebook. We also allow you to pin notes to the top of the notebook overview, which then become featured notes. These pinned notes are a great way to create a welcome note or an index note for newcomers to get oriented. You might share details of the team or how this notebook should be used. Most often you'll share links to the other notes and have the pinned note serve as an index to all the most relevant content within the notebook. You can easily link from note to note by leveraging our link style. Just copy the note url that you want to link and paste that note url into the link style to create a link. You can grab a note's url from the address bar or from the share menu in the top-right corner of a note. Notejoy's search capabilities really shine when used as a wiki. Searches are across all libraries a user has access to, so you'll be able to quickly see results across your company's entire knowledge base. And since you have a preview pane with your search term highlighted throughout the search result, you can very quickly determine whether this is the relevant content you are looking for. Compare that to the slow, multi-page experience typically required to search traditional wikis.